This hypertext book explores the psychological aspects of environments created by computers and computer networks: what I call "the psychology of cyberspace" - or simply "cyberpsychology." Revised and expanded over time, this book originally was created in January of 1996. 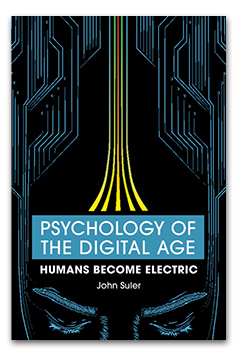 In 2016 I published with Cambridge University Press Psychology of the Digital Age: Humans Become Electric, where I describe what I learned from twenty years of cyberpsychology research, leading to a transdiscipli nary theory of "cyberpsychology architecture." My recent work also focuses on a specific area of cyberpsychology that I call photographic psychology: the study of how people create, share, and react to images in the age of digital technology and cyberspace. That link leads to my online book about that topic. In order to make these readings accessible to as many people as possible, I have written them in a style that is not overly abstract or technical. Important concepts in psychology and psychodynamic theory appear throughout the book, but I try to present them in an "experience-near" rather than "experience-distant" way that I hope makes them useful in understanding everyday living in cyberspace. The emphasis is on practical concepts rather than purely academic ones. Other versions of these articles appear in various professional journals. These publications are indicated within the articles and in the article index. Below is the table of contents for the seven major sections in this book. Clicking on a bullet will produce a pop-up window containing an abstract of the article in that section. To use this feature, you may need to turn off any pop-up blockers in your browser. All links on this home page produce a new window that is placed on top of this page. The graphic that appears to the right of each of the seven sections below is a link to the part of the overview article that summarizes the articles within that section. Recently I revised the appearance of some of the pages in this book. If you browse these articles, you'll notice a difference between an "olden days" web design to a more contemporary one, although I am deliberately retaining some of the look and feel of the way the Internet used to be. This is, after all, the "classic text." My blog at Cambridge University Press. The First Decade of CyberPsychology (1996-2006): My observations on the 10th anniversary of this online book. 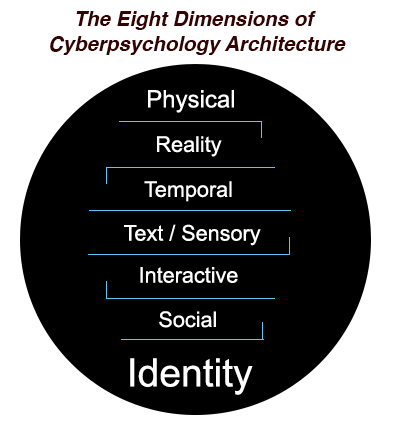 This section of The Psychology of Cyberspace contains a collection of articles about my intensive case study of the online multimedia community known as the "Palace." The Palace is a visual and spatial environment where members interact with text, sounds, and graphical representations of themselves called "avatars." It also contains an article about Second Life. This section contains articles that cover a range of topics, including: a conceptual model for conducting clinical work in cyberspace; online clinical case study groups; clinical work in online communities; avatar psychotherapy; computerized psychotherapy; legal and ethical issues. For those who are interested in rounding out their education about psychotherapy in cyberspace, this section also contains a list of suggested readings in the Psychology of Cyberspace and elsewhere on the web. Here's the day-by-day companion reader to my online books, including my ongoing thoughts about psychology, cyberspace, photography, teaching, and eastern philosophy.